Through entertaining, powerful and humorous real-life storytelling, James show us how to speak the hard truths — and get heard. She shows us why actions speak louder than words and how each of us can make a difference in our front yards, our city, our country and our world. 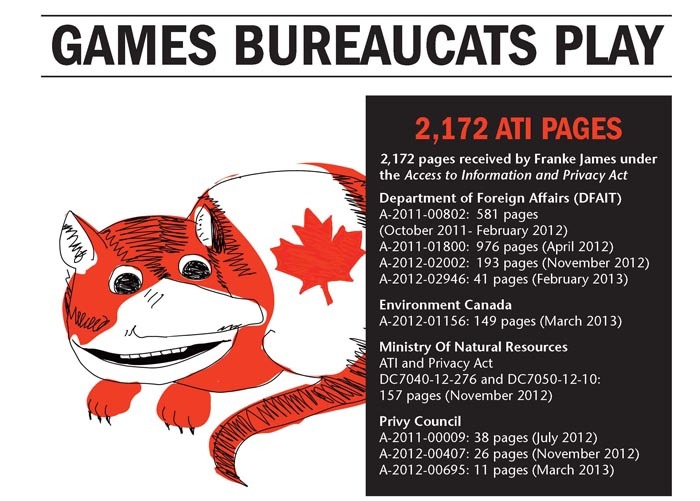 The graphic above “Games Bureaucats Play” from Banned on the Hill confirms that Franke James has received 2,172 ATIP documents from DFAIT, and three other government departments in response to ATIP requests from August, 2011 to March 2013. 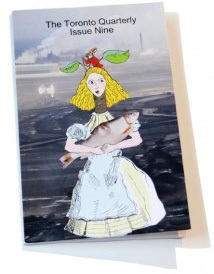 Banned on the Hill was published in May 2013. The graphic ebook is now available for iPad, Kindle Fire and Google Play. Freedom to Read 2013: Return of the Blacklist by Charles Montpetit. 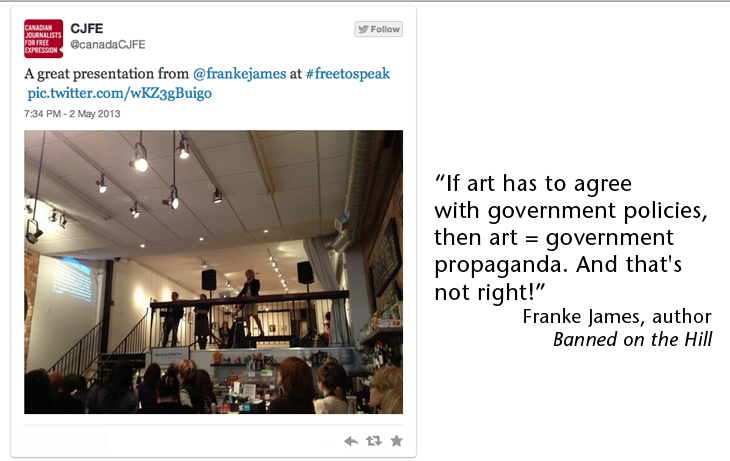 June 2012 Franke James: What Is Harper Afraid Of? Visual essay: What Is Harper Afraid Of? Or watch the animated video. February 2012 Franke James Wait a minute Mr. Postman! Do you have a letter for me? From my favourite MP? Franke James Taking my MP – Joe Oliver – Up on His Offer! Guess Who Came To The Blacklisting Party? Blacklisted by Harper? Get out the Noise-Makers! 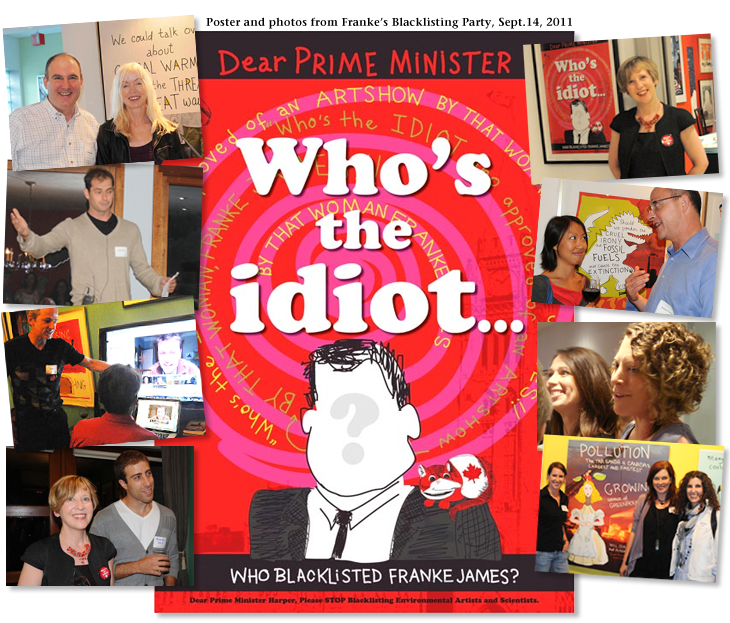 Franke James, a Canadian artist and environmental advocate blacklisted by the Harper government, has obtained internal documents indicating Canadian officials worked behind the scenes to discredit her work. An internal Department of Foreign Affairs and International Trade (DFAIT) media monitoring report from July 2011 lists James as “an inconvenient artist” (“une artiste qui dérange”), the headline of an article in La Presse. The document was part of the 1,500 pages of internal documents James obtained through Access to Information requests since August 2011. Canadian Artist Franke James Calls Stephen Harper And Joe Oliver Out In This Hard-Hitting Visual Essay. Voices-Voix: Franke James Blacklisting: Newly released Access to Information documents reveal that on July 12 2011, the Canadian Ambassador to the Baltic States, Scott Heatherington, stated in a letter to Canadian Embassy colleagues that he did not feel comfortable supporting James’ artwork. He then directed them to her visual essay “Fat Cat Canada” as an example of why support should not be granted. This makes it clear that the content of James’ work was a factor in why support for her show was refused. Read Voices-Voix summary of Franke James Blacklisting. Rabble: Bernadette Wagner: Oily in Canada, eh? UK: MIKE SHANAHAN: Blacklisted by Canada… for drawing climate-change cartoons? NEW SOCIETY PUBLISHERS: Franke James Blacklisted? Freedom of expression and access to information are core democratic values to which Canada presumably ascribes. Two recent cases, however, call into question our government’s commitment to these values. VOIR: OP-ED: Censure d’une artiste environnementaliste par le gouvernement canadien? Blogged: Dystopian Present: Want In On A Good Comeuppance? “When Nektarina decided to present Franke’s artwork in a series of exhibitions in Europe and Central Asia, we felt confident of the support of Canada – Franke’s homeland. Regrettably, the Canadian Government has since declined support for the project, verbally explaining that “She (Franke James) speaks against the Canadian Government”. Nektarina Non Profit was deeply surprised and disappointed by the reaction of official Canada, yet we decided to carry on with the project. “Nektarina Non Profit believes that it is the right of every person – artists and intellectuals in particular – to freely express their opinion and to be able to pose the question about their government’s accountability on specific decisions. This is all the more important when such governmental decisions potentially impact the welfare of a large demographic, natural resources or both. Way to go Franke James! Shame on the Conservatives for withdrawing support – although we shouldn’t be surprised. This is Harper’s way: tow the line or you’re out. You have an impressive list of intelligent supporters. Stay the course.